Solar Installations over your car parking areas, or carports as they are known, offer a convenient and effective option for institutions to start their solar journey. Here, we have the case of a healthcare institution traveling down that path. SolarMaxx, a leading PV module manufacturer in the country, has installed a solar carport at Mahaveer Cancer Hospital in Jaipur. Solar Maxx claims that the 120 kW installation will save the hospital close to Rs 13 lakhs annually on its power bills. The system incorporates an ABB inverter along with an all-in-one sun-to-socket portfolio backed by a comprehensive package of communication, monitoring and control solutions and services. It also produces higher power output and optimised Levelised Costs of Electricity (LCOE) and plant productivity. Like most new installtions today, the system offers real time information with its Remote Solar Monitoring System capable of analysing energy consumption and generation, optimising energy usage, various performance parameters, supervise the functioning and progress of the components of a solar power plant. Beyond monitoring the energy consumption of the plant, SolarMAXX claims that the monitoring system also offers many tools to help detect problems and defects with panel strings, and recommend repairs to the setup. 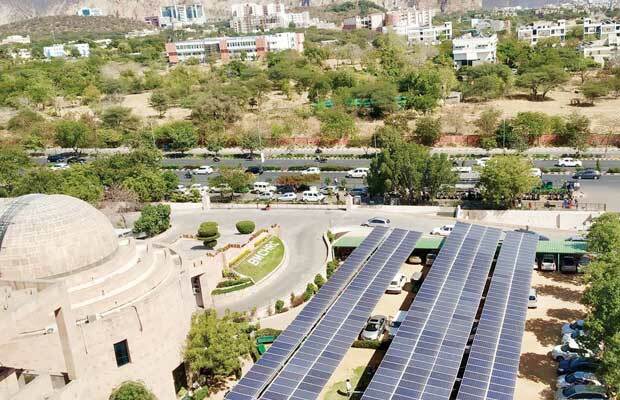 Earlier, in January 2018, in order to use clean energy for water pumping, street lights, treatment plants, hospitals, public health centres, administrative buildings, treatment plants, community centres and libraries the Nagpur Municipal Corporation (NMC) announced that it will be using solar power to fulfill its energy demands in a year. In November last year, Skoda Auto had also gone for a Carport at its Aurangabad plant, installed by Fourth Partner Eergy. In January 2019, Growatt, a global leader in inverter technology, donated its inverter, the 20KTL3-S for the rooftop solar plant at the Indore Cancer Foundation Charitable Trust (ICF), a not-for-profit charitable organisation in central India. To reduce carbon footprint and power its facilities with clean energy, ICF proposed an initiative of a 20kW solar plant on the rooftop. After learning about the program, the inverter firm donated a 20kW inverter, while also working with other parties to contribute to this solar project. The 20kW rooftop project is expected to produce an energy output of approximately 32,000kWh annually, which will provide electrical power for the whole facility and help cut the bills.